A student interested in history or architecture might wish to look at the information on merchants of the eighteenth century in Salem, the images of the houses where Elias Haskett Derby lived, and the image of Derby Wharf shortly after Hawthorne's time. Then the student might use those sources along with the description Hawthorne gives of Salem at the beginning of the "Custom House" chapter to write an essay discussing how maritime Salem of Hawthorne's time, in the mid-nineteenth century, differs from the Salem of the Golden Age of the late 1700s. 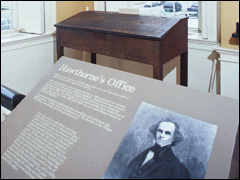 A student who enjoys creative writing might wish to look at the architecture of the Custom House and the panoramic tour of Hawthorne's office and then use these materials and the sections of "The Custom-House" chapter in which Hawthorne describes life at the Custom House and his fellow employees to write a creative, first person piece from Hawthorne's viewpoint which reveals his attitudes toward his job and the people at the Custom House.